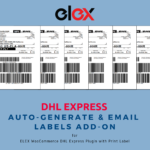 Tired of manually generating DHL Express shipping labels? Wish you could receive an email notification with the label? Time to turn to automation! 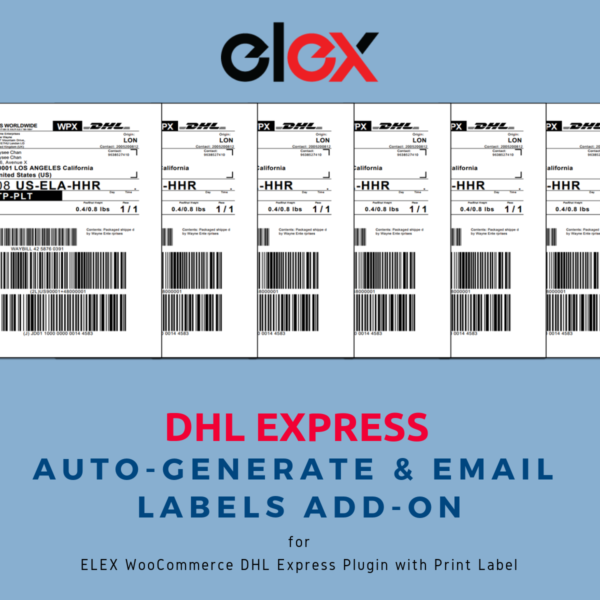 The ELEX WooCommerce DHL Express Auto-Generate & Email Labels Add-On lets you take a backseat and automatically generates shipping labels for you, whenever an order moves to specified order status. You’ll receive a copy of the shipping label via email. You can also choose to send a copy of the shipping label & shipment tracking link to your customer’s and/or custom email address(es). In addition to this, the add-on allows you to send an email notification to shop owners when DHL fails to return real-time rates. 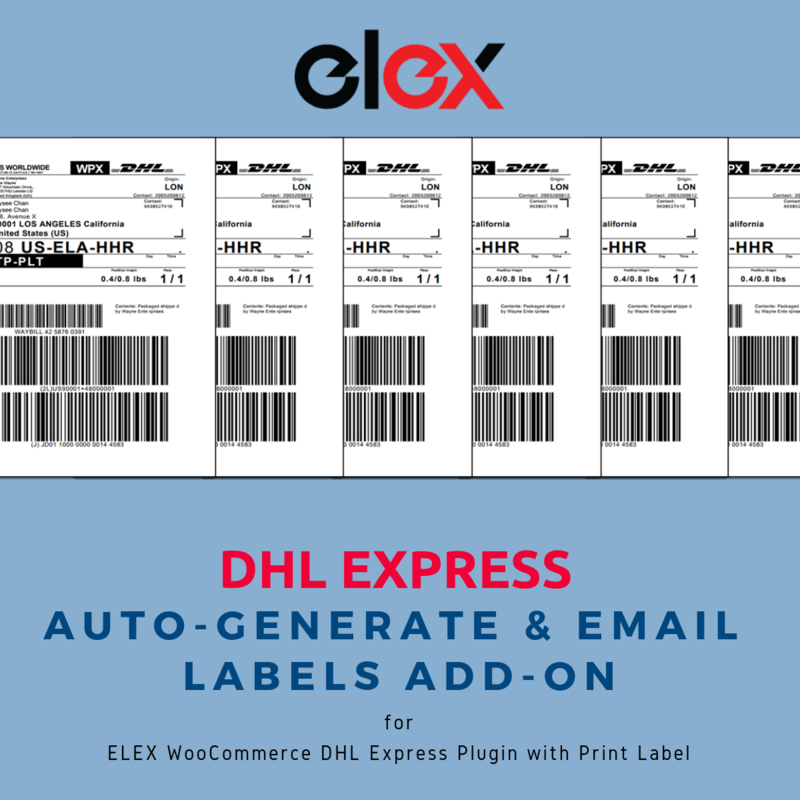 This add-on works only with ELEX WooCommerce DHL Express / eCommerce / Paket Shipping Plugin with Print Label. 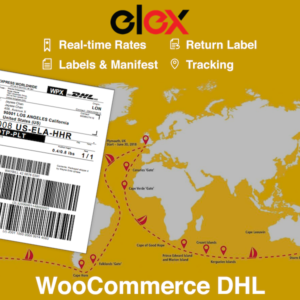 When it comes to WooCommerce and DHL integration, our ELEX WooCommerce DHL Express / eCommerce / Paket Shipping Plugin with Print Label is quite popular in the WordPress market. Our efforts to make this plugin to be the best WooCommerce plugin for DHL has made us an Official DHL Partner. Access real-time rates from DHL Express. Print shipping as well as return labels. Print Archive Air Waybill and Commercial invoice. Generate bulk shipments and much more! The add-on lets you select order status(es) during which you want to generate DHL Express shipping labels and receive an email notification, with the generated shipping label. 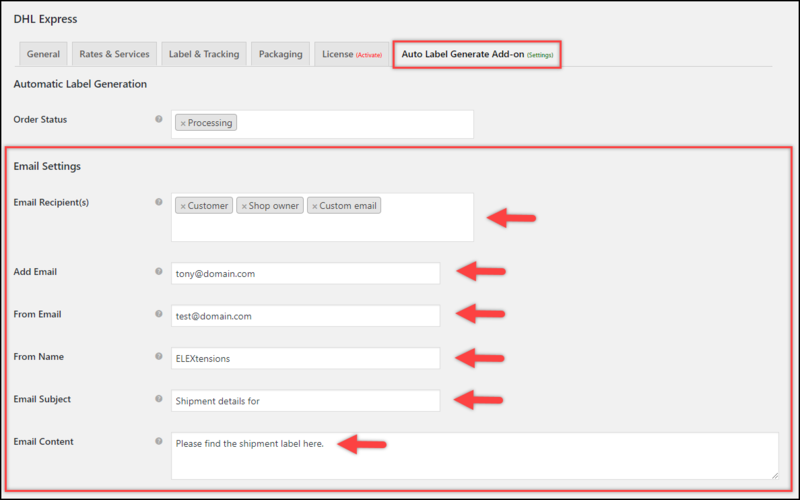 If there are multiple packages in order, multiple labels will be generated and notified via single email. You can enable this setting to notify shop owners when a shipment creation fails. This may occur when an order is placed with other shipping methods/services other than DHL Express services. The add-on allows you to compose custom email subject and content for the same. When you receive emails notifying about the shipment of the order, you can click on the given shipping label link to view the label. 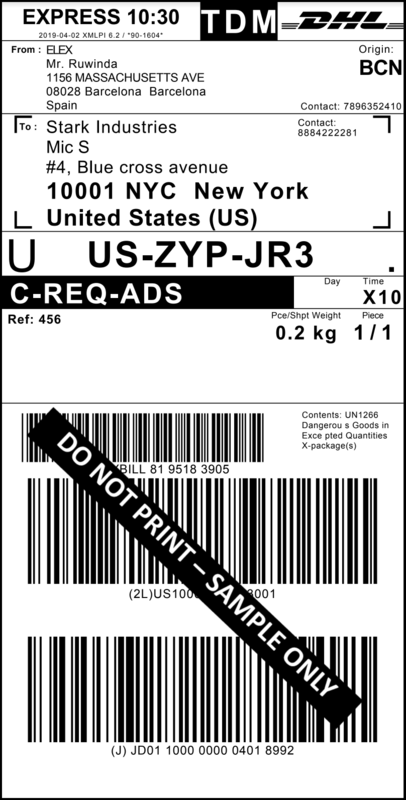 A sample DHL Express shipping label is shown on the left. Can the plugin work without the ELEX WooCommerce DHL Shipping plugin? No, the plugin is an add-on for the ELEX DHL plugin. The shipment creation and label generation in the add-on works in accordance with the plugin. Can I create DHL Express shipments with this add-on? The add-on checks whether a shipment is created for an order. 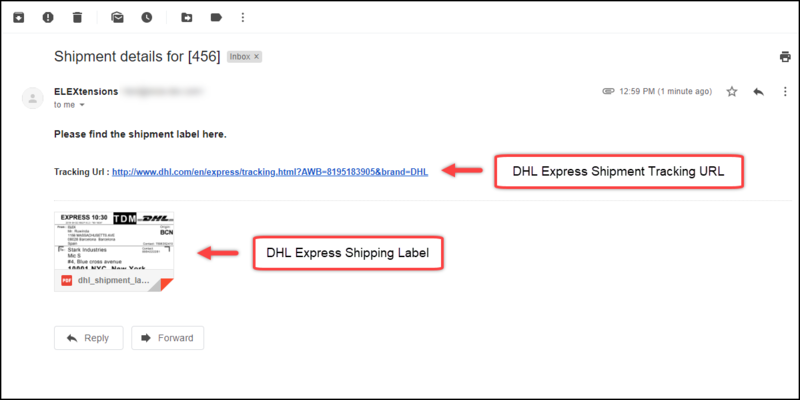 If not, it requests the ELEX DHL shipping plugin to create shipments and then retrieves the label URL and sends via email.